Having lived in America for my younger life, the prices of New Zealand fabric initially floored me. Paying between 15$ (cheapest) to 30$ for a meter - (3 inches longer than the American yard) seemed indecent somehow. 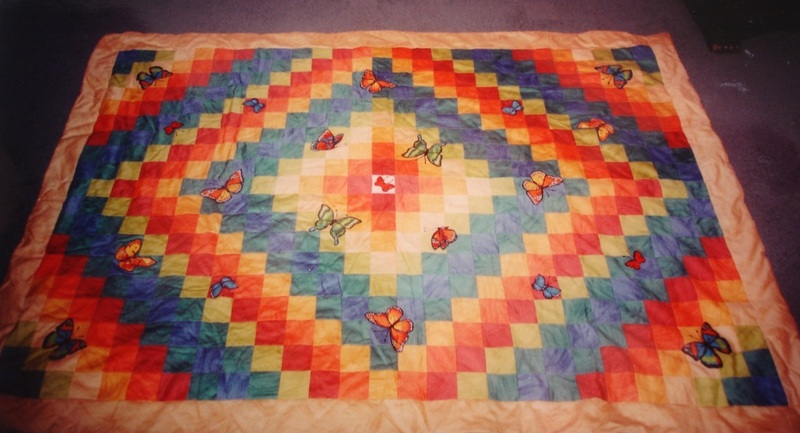 A woman from the quilt club brought a creation she had made entirely from out-of- date furnishing samples. Not to miss a potential gold mine, I rushed off to the curtain/carpet shop and for ten dollars acquired this assortment for Beth's quilt! They were only slightly heavier than quilting fabric and worked fine. Added some butterflies fussy cut from another piece of fabric already in my stash and voila!